Not all heroes wear capes. Some happen to wear book bags and are on their way home from class when they come across someone who needs saving. 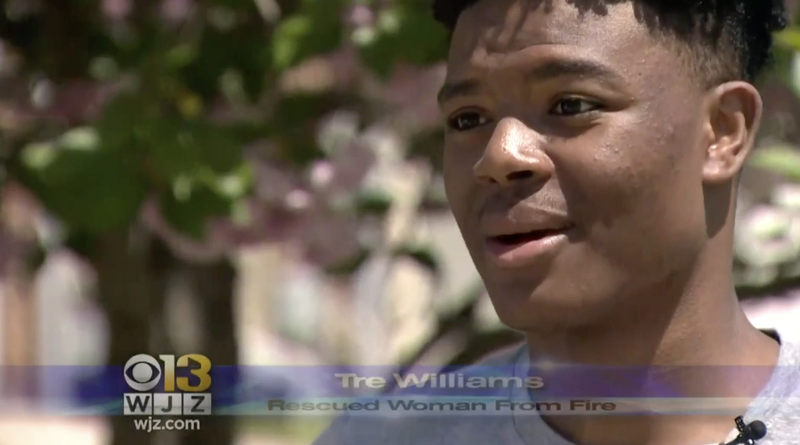 In Tre Williams’ case, it was an 80-year-old Glen Burnie, Md., woman who couldn’t get out of her burning house. On Wednesday, Williams saw Gail Johnson’s home engulfed in flames, but with the commotion and noise of the fire trucks, he was the one who heard Johnson’s cry for help. “I yelled to the fire department, ‘Somebody’s in the house,’” Williams told WJZ-TV. “But it was loud, like the sirens, and there was a lot of cars driving by. “So at that time, that’s when I jumped over the fence and went in and opened the door for her. She was struggling to get the door open,” Williams continued. Johnson’s family believes it was an act of God that Williams happened to be in the right place at the right time, and the college student is being called a hero. But Williams said he’s no hero; he was just following the values instilled in him by his mom.